These are the terms and conditions on which we do business for goods ordered through this website. They are intended to be fair to both the customer and layout our role as a supplier of fancy dress and party accessories. They do not affect the consumer's statutory rights. They are designed to set out clearly our responsibilities and our customers rights. Images, illustrations and all other information contained on this website, catalogues and other advertising matter shall not be deemed to form part of the contract, they are for general information and guidance only. Customers must read and base their purchase upon the description of the costume. Once orders have been placed they are immediately sent to the warehouse for dispatch in order to provide the fastest delivery possible and once dispatched cannot be amended or sizes or items changed. Customers must ensure they check their order carefully before submitting it for payment. Orders without contact details may not be dispatched - these orders will be held until we receive full delivery information including contact number and complete address. A contract is formed between us when (and not before) we ship a customer order. The order will not be accepted until we receive payment or in the case of cheques until funds have been cleared. 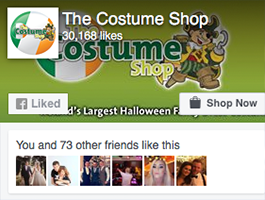 Cheques, bank drafts and postal orders should be made out to "The Costume Shop". If you fail to take delivery of the ordered goods and they are returned to us, we will contact you upon their arrival via email. A refund of the cost of goods without shipping will be given. If the goods are still required, we will require an additional shipping fee to make a second delivery. It is the responsibility of the customer to be at the delivery address given for shipping as costumes cannot be left without signature. Customers must be available on their chosen contact number to facilitate the courier with delivery. Please note that if a customer does request a call before delivery from the courier, we pass the request on to the courier company and cannot guarantee that they will call. Please note if complete shipping information, including a correct phone number are not provided this will cause a delay of at least one day and the full shipping charge will still apply. Risk of damage to or loss of ordered goods becomes the customers responsibility at the time the goods leave our premises for delivery. Usually everything displayed on our site as in stock is present in our warehouse and available for immediate dispatch. If any ordered goods are not readily available to us, we reserve the right to withdraw our acceptance of your order for such goods. We will refund in full any payment the customer has made for such goods. To avoid any doubt other goods ordered by the customer will be dispatched in the normal way. In the unlikely case of this happening we undertake to notify the customer at the earliest opportunity. It is our experience that delivery is 99% of the time within the chosen delivery time periods. We use a third party delivery service and on occasion human error may cause a package to be misdirected. TheCostumeShop.ie cannot be held responsible for a package not reaching its destination on time as delivery is the responsibility of a third party courier. We suggest to customers to order costumes well in advance of the party or event they may be attending to allow for unforeseen delays. The customer should notify us if they do not receive their package when expected. We will ensure it gets delivered as soon as possible. We guarantee that should delivery not be within the specified time the customer will be entitled to a full refund on the shipping costs, where the courier or postal system is at fault (this is not applicable if unsuccessful attempts were made to contact and deliver you package). Upon delivery, it is the customer's responsibility to check the contents of their packages and inform us of any discrepancies at the earliest. We warrant that, upon receipt of goods, the ordered goods will correspond with the written description on this website, will be free from defects in materials and workmanship and will be of merchantable quality (as set out in Sale and Supply of Goods Act 1980). There may, however, be minor variations between the goods as shown or described on our website and those dispatched to you (the goods dispatched will always be of a comparable or superior quality). Upon receipt of goods please immediately check to ensure you are satisfied by the product as once an item is worn to a party it is no longer eligible for a change of mind or refund after use. If you believe the product is faulty please contact us immediately. If alterations are made to the product, the items are deemed as fit for purpose and are not thereafter eligible for a refund. Please refer to the cleaning instructions on the product packaging before washing. Where our sales agents suggest items that are not available on our website but that we may order in for a customer, all quotations are valid for two weeks unless otherwise agreed in writing. Items will not be ordered in until full payment has been made and funds have been cleared. Wholesale and B2B orders that are discounted from our list price are not eligible to be refunded or cancellations once the products have been ordered in with our suppliers, unless the products deilvered are faulty. Please ensure you provide a full and correct delivery address and a correct phone number on your order. While 99% + of our deliveries arrive within the expected time frames, there is a possiblity that the order can be delayed due to human error. The number one reason an order tends to be delayed is due to incorrect information being provided. Please provide a house / apartment number (if available), the address road, area, county and eircode. Please avoid using Vanity Addresses", definded as subsituting a location area into your address which differs from that of your address on the title deeds of the house. An example being if you live in Stillorgan but enter Foxrock as the location address because its near by and sounds more affluent. The delivery driver has a set route and this will result in the delivery being delayed by at least one day. Likewise if you are entering an international mobile number which is different to the location you are in, for example entering a UK phone number and an Irish address, you must include the correct prefix. Where incorrect delivery information has been provided, shipping charges will be non refundable and we cannot take any responsibiity for late deliveries. We reserve the right to vary these terms and conditions at any time but, in respect of any ordered goods, the terms and conditions which apply shall be those which the customer has accepted when an order has been placed. Once an order is placed customers are deemed to have read and agreed to the terms and conditions, the returns policy and our price gaurantee terms.